Canadian members of the team. In late August, 166 young space professionals and students from around the world gathered at NASA's Ames Research Center to give their input on the future of space exploration. The event was called the Next Generation Exploration Conference (NGEC) and was by invitation only, bringing together the leading young people on the planet with a passion for space. The conference was an official NASA follow-on conference to the Exploration Strategy Workshop held in April in Washington, DC, which brought together leaders from the world's top space agencies to set out the working goals of the lunar exploration to come. During that conference, attendees realized that it would be important to hold a similar event for the young people who will make the exploration vision a reality during their careers. Ryan Kobrick, a graduate student in aerospace engineering at the University of Colorado at Boulder, was one of those young leaders. Here he gives his journal of this historic gathering. July 6th, I received an instant message from my Mars analogue research collaborator and close friend Melissa Battler saying "hey! wanna talk to you... NASA Ames is organizing a conference, which will be a follow-on to their Exploration Strategy Workshop (ESW)." Melissa had been tasked with forming a short list of Canadian and International students to attend the NGEC and wanted some help narrowing down the pick of the crop, which was an extremely difficult task given the high quality of the space enthusiasts that we have had the pleasure of working with thus far. As I was helping her I remarked, "this is like picking an all-star team" to which she replied "IT IS!! 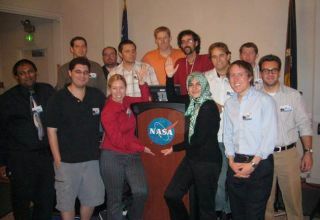 ...THIS my friend, is the dream team..." Various United States and European professionals were also actively forming lists and submitting them to conference organizers, who were tasked by the NASA Exploration Systems Mission Directorate and NASA Ames Research Center Director Dr. Pete Worden to make this conference happen. The participants included a spectrum of minds including some from academia, government agencies, private companies, entrepreneurs, and aspiring employees. ... Because it was an opportunity to shape the future of the world using space as a frontier and inspirational tool to expand the collective global mind. NASA was the primary sponsor the event, and financially supported a large portion of the delegation to attend the conference. My funding came from three sources including my Ph.D. advisor Dr. David Klaus, the University of Colorado at Boulder's (CU-Boulder) College of Engineering and Applied Sciences Dean's Office, and Optech Incorporated. Optech's Bob Richards, who co-founded the International Space University, has continued to support the next generation of space leaders, and because of his company's support, several Canadians who couldn't otherwise have attended were able to make it to the NGEC. Missing this event would have been like missing the Super Bowl after watching the entire season. Some were not as fortunate as others and were not able to secure funding to attend even though the event offered rare recognition. Input from the absent participants was missed and unfortunately will not be a part of the conference's final proceedings. Through future conferences and remote continuation of the work started at NGEC, however, the missing thoughts and opinions will eventually find their way into the collective documents, and become part of the overall plan for the future of exploration. Who was there and why?... "emerging leaders, students, and early-career professionals with a keen interest in manned spaceflight. This conference [was] a planning session to develop strategies for human space exploration in the 21st century, as humanity prepares to return to Earth's nearest neighbor in space: the Moon." On one hand, the Moon is right there and humankind has "been there - done that" already. However, on the other hand, this next generation wasn't alive then, so while we do have approximately 385 kg of lunar samples, science data, some amazing stories, and inspiring images such as the "Earth-rise" shot, which is the most published photograph in the world (including my cell phone background), WE have not been there, or experienced the excitement first-hand. We are not just going back, we are going back with the intention of staying. The Moon is part of our "cis-lunar" environment and therefore an essential celestial body to our voyage and eventual expansion. We need to climb the foothills before we can climb the Himalayas, which is why we need to go to the Moon before Mars and beyond. The initial email sent out by the conference organizers to the selection committee stated the importance of the participants very clearly: "It is this group that will be developing the exploration technologies and living on the Moon. These are the people that have the biggest stake in lunar exploration and beyond." The participants were divided into six main working groups: Mars science and exploration, Mars settlement and society, Asteroids, Cis-Lunar, Earth 3.0, and Virtual Exploration and Virtual Worlds. The majority of the conference was spent working in these groups with interspersed keynote speakers. The greatest theme the groups addressed was, "Why the Moon?" as it applied to their subject. Answering this fundamental question is a driving factor for being able to sell our quest to the general public. There are many reasons why, but applying the answers to the correct audience is also a skill that we all need to work on. During the three-day event, the working groups main tasks were editing the overall themes and objectives of lunar exploration, as established at the Washington DC Exploration Strategy Workshop. A common file (developed at the ESW) was distributed, and after several round table discussions the groups formed subset groups to add their input. Although working together to shape the future outlook of space exploration was the focus of the conference, for many, the most important aspect was the forming of interpersonal connections with brilliant minds from all over the world; a truly international group of well informed individuals working together, forging new relationships, and pushing forward to become the space fairing world that we envision. NGEC masters of ceremonies Kennda Lynch, and a fellow graduate student at CU-Boulder, remarked "This conference is just the beginning". The beginning to a story of how the Next Generation of space explorers has become the Now Generation. Recommendations were drawn from all of the working groups and conveyed in short final presentations. These subsets of results were a broad overview and not representative of the entire results derived by the working groups. The final results will be available after they are compiled and uploaded on the NGEC website. Interestingly enough after all the final presentations, the participants asked the round table of speakers to start the ball rolling and asked them in several different ways what they were going to do to make a difference after the conference. Outreach was the main answer, and seems to be what this generation actually does best. Could this be the key to our future in space? The mechanism has attracted the minds that have already made breakthroughs throughout history, and maybe outreach will recruit the next Warner Von Braun's to bring us further than we have gone before. The two main recommendations coming from the working groups were that there needs to be more NGEC-type events, and that a formal international advisory group needs to be developed. This group could then carry-over work directly to government agencies. Government agencies need to examine and pursue the things that only they can do to help foster the economic development of commercial ventures. Governments need to lay down the railroads and pave the way to space, so that we, the Now Generation of space explorers, can work to together with the existing powers expand our knowledge, and perhaps even to save our planet. Countries Represented (17): Australia, Canada, China, France, Germany, India, Ireland, Italy, Japan, the Netherlands, Norway, South Africa, Spain, Switzerland, Turkey, United Kingdom, and United States of America. Conference website: http://ngec.arc.nasa.gov/. Conference proceedings will be available on the website soon. The next international event for young professionals will be the Space Generation Congress (Sept. 28-30) in Valencia, Spain, which precedes the 57th International Astronautical Congress (Oct. 2-6): http://www.spacegeneration.org/ and http://www.iac2006.com/. The next glimpse into the future will be at the X PRIZE CUP: Earth's Great Space Exposition (Oct. 20-21): http://www.xprizecup.com/. Ryan L. Kobrick is currently pursuing his Ph.D. degree in Aerospace Engineering at University of Colorado at Boulder and is a Research Fellow of the X PRIZE Foundation.